David Hasselhoff started appearing in school plays when he was eight, and announced he would be an actor after his first performance, in a kids' production of Rumplestilskin. His parents enrolled him in drama classes before puberty, he was a regular in community theater from the age of nine, and he continued his study of theater through college. He thought he would sing in Broadway musicals, but a different opportunity knocked, and instead he played a dashing doctor on the daytime soap opera, The Young and the Restless, in the 1970s and early '80s. He left the soap for prime time in 1982, starring in the action series Knight Rider opposite a Pontiac Trans-Am with a mind of its own. Knight Rider was translated and broadcast in 82 nations, and the show and its star were even more popular in Europe than in America. So after the show was cancelled Hasselhoff moved to Germany, reinventing himself as a pop singer. His first album was titled Night Rider, and his biggest hit was “Looking for Freedom” -- celebrating the toppling of the Berlin Wall -- which topped the German pop charts in 1989. The high point of his career, Hasselhoff has said, was singing "Looking for Freedom" from atop the Berlin Wall as reunified Germany celebrated the New Year in 1989. Hasselhoff returned to Hollywood in 1989 to star in a new series, Baywatch, opposite a bevy of bikini-clad beauties. The program lasted only one season on NBC, but Hasselhoff believed it could be a hit, so he purchased a 25% stake, brought in some investors, and took Baywatch into first-run syndication. 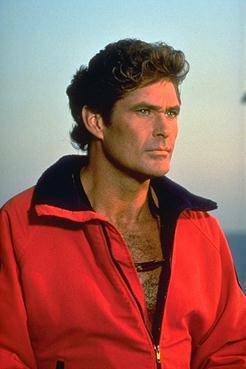 It became a huge hit and ran for eleven more years, leaving Hasselhoff as one of the world's wealthiest washed-up actors. His house was destroyed in the 1994 Northridge earthquake, and Hasselhoff has since moved his family to Encino. He had two more top ten singles in Germany, "Is Everybody Happy" in 1989 and "Wir Zwei Allein" ("We Two Alone") in 1993. He briefly made it to Broadway, singing the dual lead in a production of Jekyll & Hyde: The Musical that was filmed for television. He has taken small roles in major movies, most recently playing a befuddled executive in Click with Adam Sandler. Hasselhoff has also starred in several theatrical duds, including Bail Out with Linda Blair, Legacy with Rod Steiger, and Layover with Gregg Henry. In 2006, despite Hasselhoff's lobbying, he was passed over as star of a Knight Rider revival, but he spent three years as a judge on the amateur competition America's Got Talent, where his contract was allowed to lapse in 2010 after several incidents of Hasselhoff being drunk in public and/or on video. He hopes to star on Broadway in a musical he has co-written, tentatively titled David Hasselhoff: The Musical.